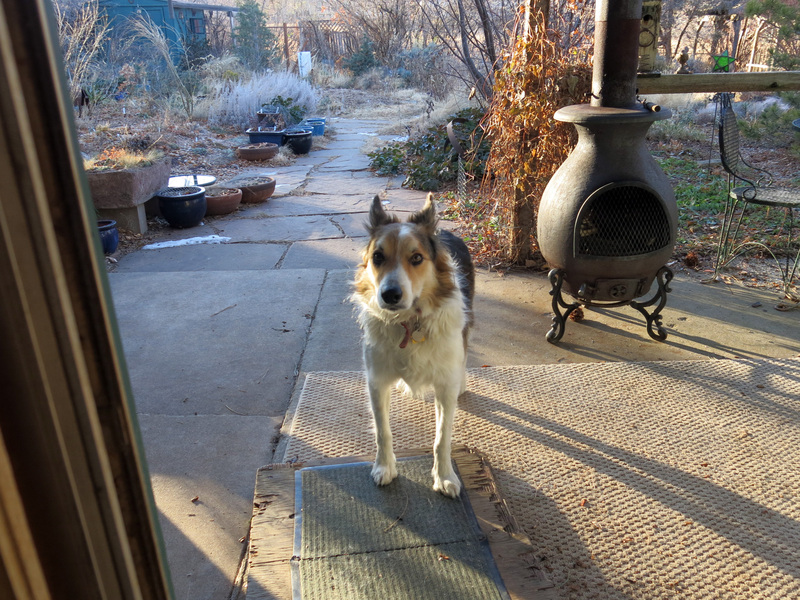 Greetings and salutations, everyone; yes, once again it is I, Mani the excellent purebred border collie, filling in for the guy I live with, and here to bring you the latest news from our garden. You may remember me from such posts as “Most Improved”, among so many, many others. Here I am in a characteristic pose. Waiting for the guy I live with to come outside with me, as usual. I really like gardening and have a very enjoyable time when he’s out in the garden, too, but sometimes it does involve an awful lot of waiting. Eventually he did come outside, as you’ll see in a bit. 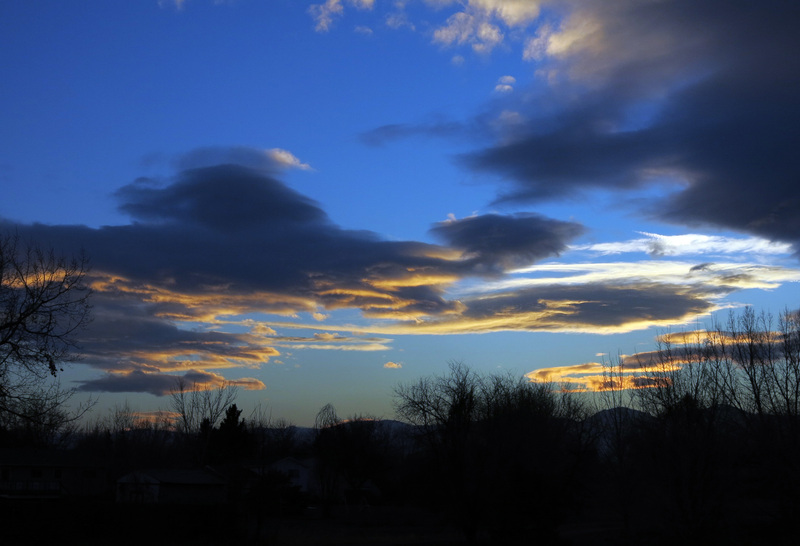 There was a pretty nice sunset last night; the first sunset of the new year. It was not warm on our evening walk, though. Today the guy I live with went to the store. I never get to go. He says I would be bored, but considering the things he brings back–about half of them for me–I can’t see how that could be possible. Maybe he’ll take me next time. 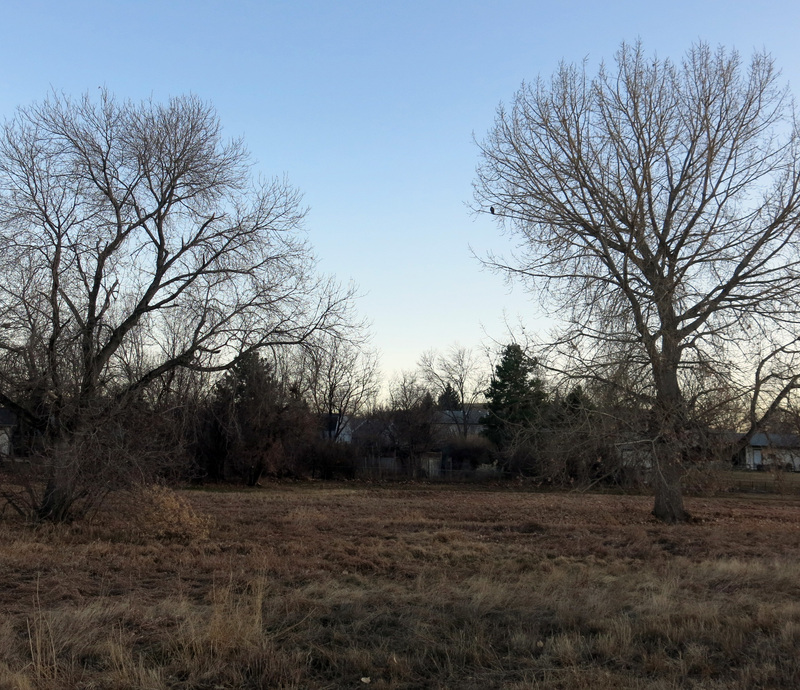 Before he left, he stopped and talked to his neighbor, who also lost his wife, to see how he did over the holidays. It was about as expected. When he came back from the store, there were seeds in the mailbox. Or maybe I should say that there was a padded envelope full of packets of seeds in the mailbox. The mailbox wasn’t really full of seeds; that would be silly. After all the groceries were put away and I got to try one of my new biscuits, the guy I live with went about stratifying a bunch of the seeds he got. These were all species of calochortus, if you needed to know. I suppose this has been talked about before but the guy I live with said this would pad the post a little bit, so here you go. These are all the things necessary for this procedure. The spoon is a special spoon which his late wife bought just for “seed stuff”. 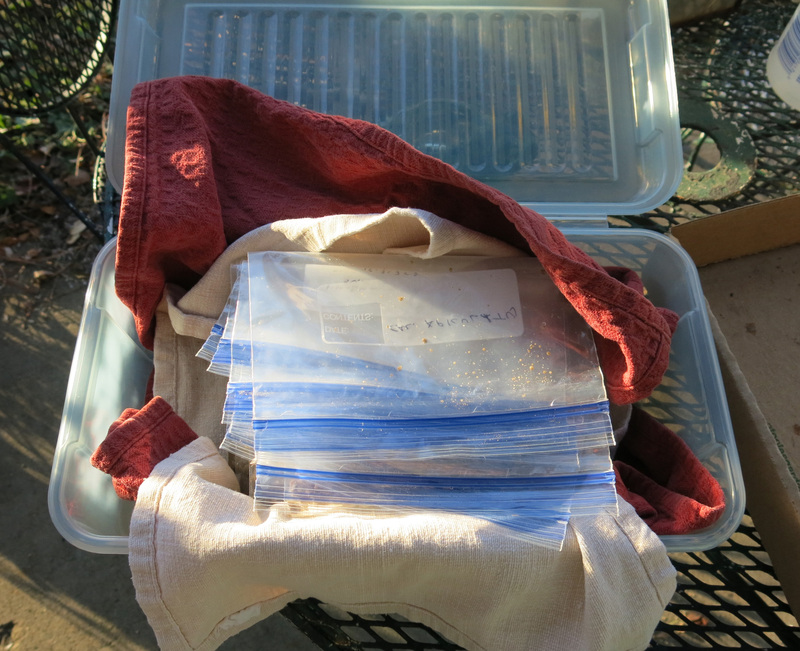 The purpose of stratification, as I learned today, is to keep the seeds moist and at about forty degrees Fahrenheit for a month, or two months, in order to break down the germination inhibitors. 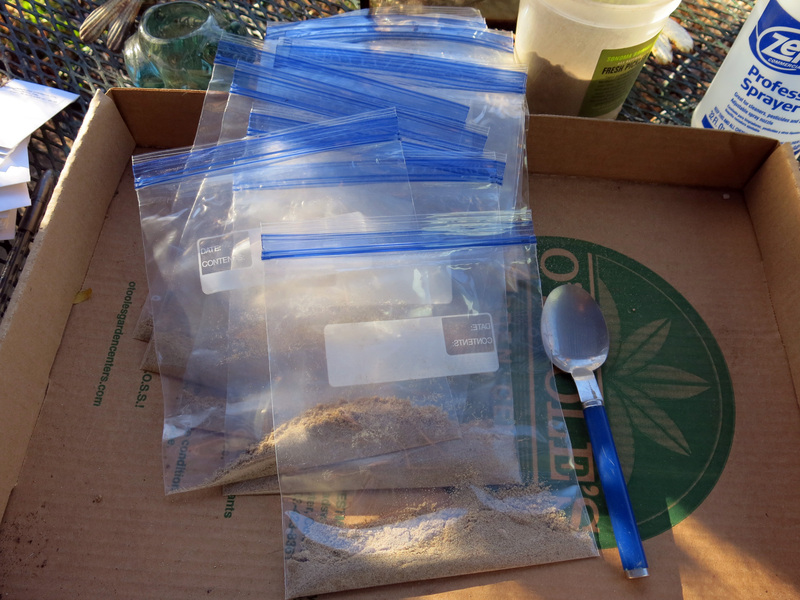 Sand was put in freezer bags. The “medium” doesn’t have to be sand, but the guy I live with has used all sorts of other things, like perlite and vermiculite, and likes sand the best. This is just “play sand” like you get at a box store. The seeds are sprinkled in. More sand is added, and then water is sprayed in to get the sand damp. If there’s too much water, like some of the seeds are floating, more sand can be added. Then the freezer bags go into this box, and the box goes into the crisper drawer of the refrigerator (not the freezer). The towels are to help keep the seeds from freezing. That’s all there is to it. The seeds will be checked in a month or so to see what’s happening (okay, seriously, they’ll be checked about every two days, but they don’t need to be). After a month or two the seeds will be sown in pots under lights and the seeds will germinate. Hopefully. The guy I live with said that sometimes you can see action while the seeds are still in the bags. The embryos start to swell and move toward the tip of the seed (the micropyle). Well, that’s it for today. 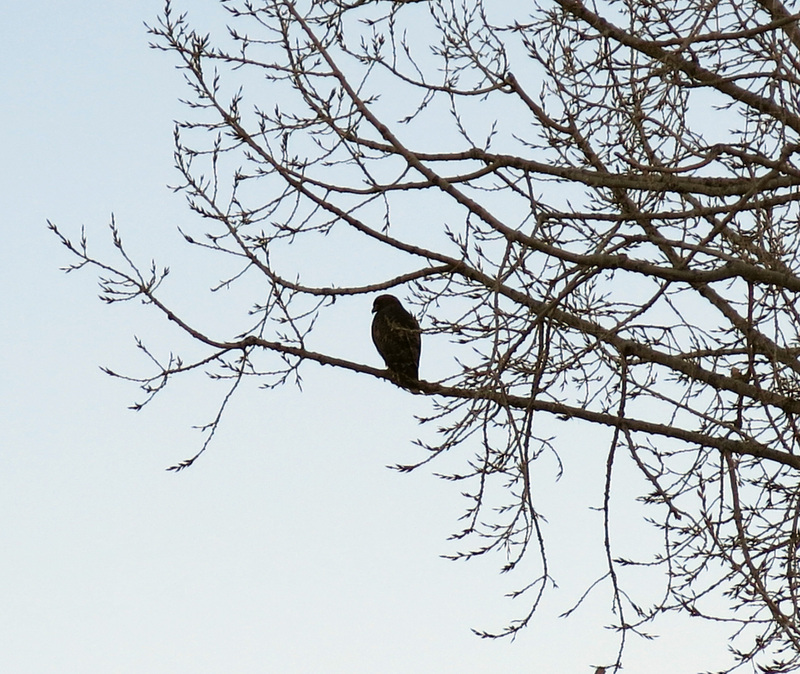 I hope you enjoyed what turned out to be a rather informative, if somewhat flighty, post. I just mentioned stratification and scarification in my recent article. I could not go into much detail for the main article, since it must fit into a particular format that fits into the newspapers. I suppose I should have added a bit more information for my blog. Oh well, too late now. 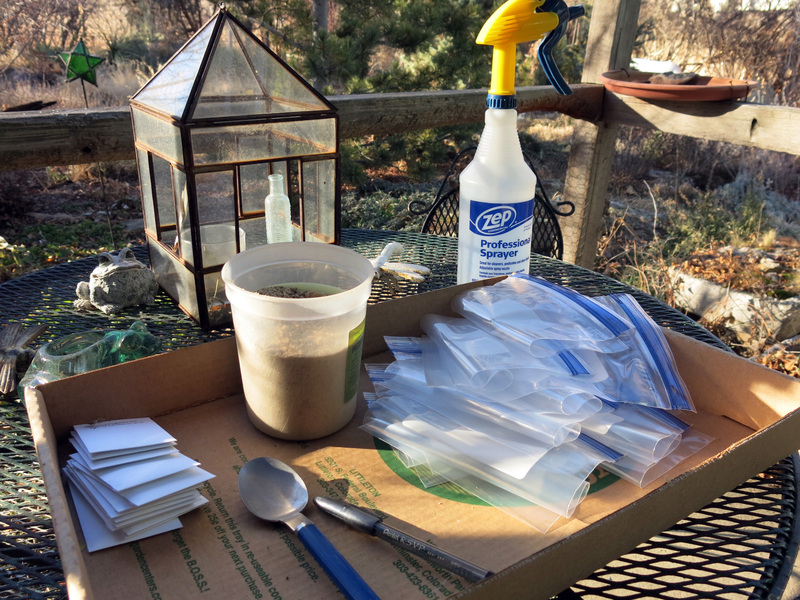 Can your seeds be stratified by simply sowing them and then leaving them out in the weather through winter, or does it get too cold for those particular seeds? I almost never stratify seeds. I just put them out about now and let the weather do the work. It does not even get too cold here. 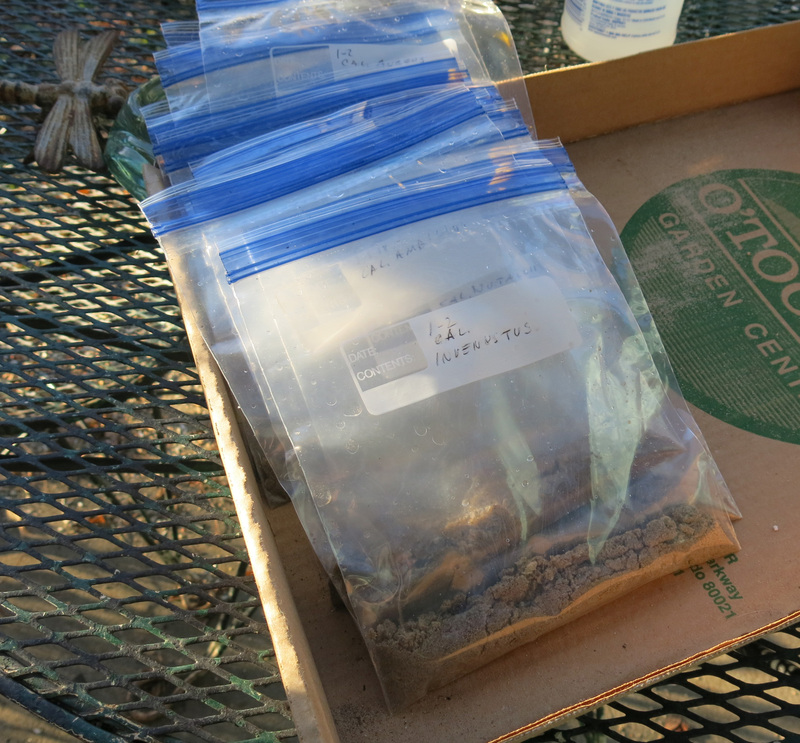 I only stratify seeds from colder climates. Technically, “stratification” is seed sown between two layers of media. Most seed here is just sown outdoors in pots. But stratification in the refrigerator gives more control. In theory. There are a lot of creatures outdoors who are very eager to eat seeds. Not very much bulb seed does well if sown outdoors; maybe for that reason. So, it is the potential for getting eaten that necessitates the process. Yep. The guy I live with had this phone conversation with his friend in the nursery business, about how hard it was to get rice grass (Achnatherum hymenoides) to germinate, and how after nothing came up the following spring, he realized that he was sowing a highly nutritious, rice-like seed onto the ground. The Forest Service recommends sowing seed of that particular species a quarter of an inch deep, just because of that. Hi Mani, Glad you at least got a nice doggie treat. Going to the store is a bore, but I do understand why you would like to go just to ride around and look at things. I have trouble with seedlings because my chickens eat them. I planted a ton of sunflowers and well nothing came up. LOL I may have to keep the chickens locked in their pen this Spring. Poor things. They are getting use to being in their pen anyhow since something got their love Fabio. Well have an enjoyable day! Thanks; I always get lots of treats. Well, not lots, but some. I think it would be fun to have chicken here. (We can’t have them here.) They would be fun to boss around. The business with seeds being eaten is really a serious thing and explains why a lot of seeds which were just sprinkled on or in the ground never germinated. It never even occurred to the guy I live with that that was happening, even though we feed the birds here…..
What an exciting day you had! I’m looking forward to seeing how you sow the Castilleja! Thanks; it was pretty exciting. It’ll have to be about to snow before the paintbrush seed is sown. A flighty post, *chuckle*. That was one plump hawk. 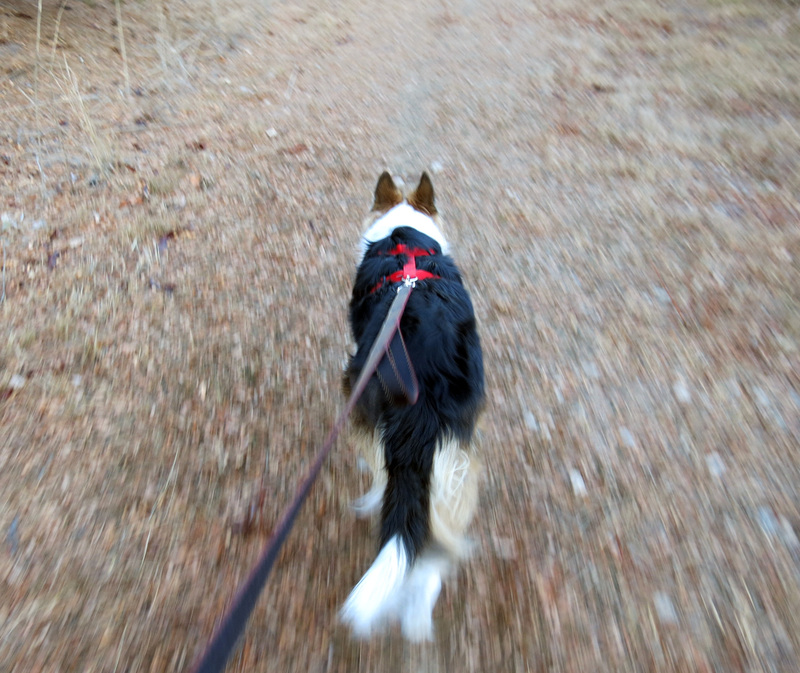 I imagine living with hawks is a certain kind of treat for a border collie. You could not come to the store with us, Mani, because you would have to wait in the car while shopping took place and its too hot for you here in a stuffy car. Cars get way hotter than you would like, believe me, even with windows open. The next time the guy you live with tells himself – and us, and possibly you – that he doesn’t do much, tell him to please open the refrigerator door, than the vegetable drawer, and then he should gaze upon the bags and bags labelled and filled with sand and seed and then sealed. Remind him it wasn’t the Seed Fairy who accomplished all that. I look forward to another year graced with your charming characteristic photos, Mani. I’m not exactly sure why I would have to wait in the car if I got to go to the store. What would be the point of me going to the store if I didn’t actually get to go to the store, just to the parking lot? The guy I live with can’t explain that one. He said he would just get me more stuff next time. They have these snacks which cost twice as much as regular ones (say twice as much as Newman’s Own, or Fruitables) and which are super good and maybe he’ll get me some of those, in addition to the Newman’s Own and Fruitables and Good Buddy biscuits I get. In other words, more. 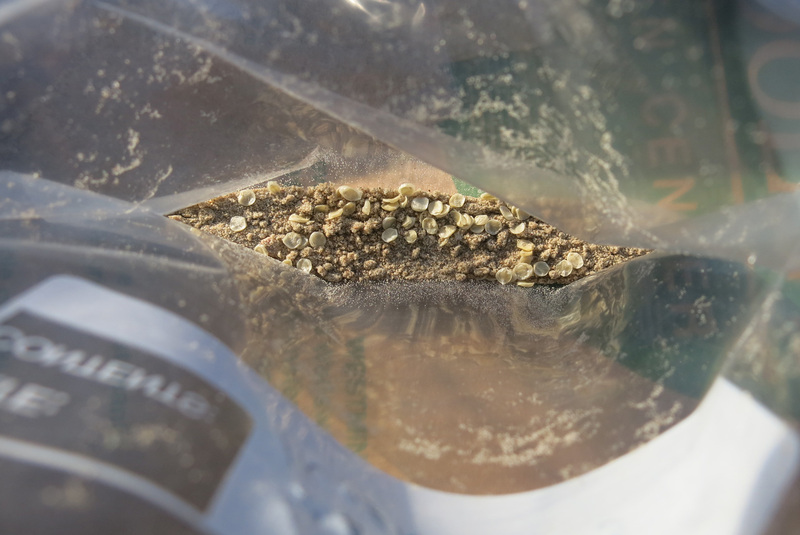 It took less than half an hour for all the seeds to be stratified. Not much in the way of work. Mani, I needed to know it was calochortus that was sown, so I am glad you mentioned it. There will be an adventure to follow, then, watching those little things come along. Thanks; we hope something will happen. It doesn’t always. Sometimes the seeds just rot, or they never germinate. Ever get Bocce brand treats? Our grandpuppy likes those…and they even come in Birthday theme! Thanks; maybe I’ll tell You Know Who to look for them.